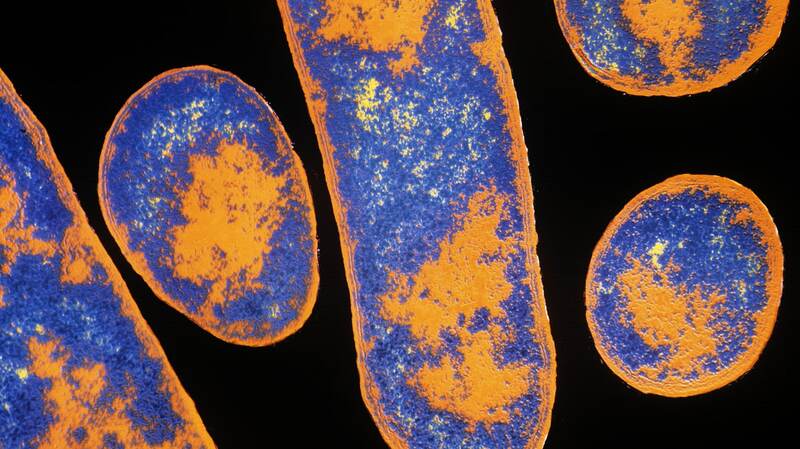 The clostridial group of diseases are caused by clostridial bacteria. It is important to understand that these bacteria are anaerobic, spore-forming organisms. This means the organisms do very well in a low oxygen environment, such as tissue material and organic matter, and that they can survive for long periods in a dormant state as spores. Once they find themselves in a highly favourable environment, they will multiply rapidly and release harmful toxins that will wreak havoc. Symptoms of diseases in this group include rapid necrosis (tissue death). This can occur with or without the presence of gas, the latter being worse. Some of the most important diseases in this group are blackquarter, swollen head (dikkop), malignant oedema and uterine blackquarter. The most important symptom of diseases in the second group is intestinal inflammation, which leads to several other problems. Some of the most important diseases in this group are pulpy kidney, enterotoxaemia and lamb dysentery. The third group of diseases attack the nervous system and is characterised by stiffening or paralysis of the muscles. Some of the most important diseases in this category are tetanus and botulism. If an animal is affected by tetanus, explains Dr Cloete, it will often die suddenly due to a lack of oxygen or heart failure. In the case of botulism, or lamsiekte as it is known in Afrikaans, the muscles become paralysed and the animal will lie down. It cannot eat and drink and can asphyxiate. This article is the eighth in a series of informative animal health articles. The series goes hand in hand with the #VideoVet video series that can be viewed on www.agriorbit.com. Watch the video below. Thank you for the support of several role-players in creating this series: the Gauteng Department of Agriculture and Rural Development, Dr Gillian Declercq and the CCS veterinarians (Dr Dzunisani Ngobeni, Dr Lindsay Parvess and Dr Heidi Kuhn), MSD Animal Health, as well as Kenneth Ndlovu and the Amogelang team for their assistance and animals for demonstration.